This time of the year, the blogs and especially American blogs are all showing off what they can do with a pumpkin or some sweet potatoes. Being from the UK, I can’t say we embrace the Autumn produce as much our American cousins. Like I’ve said on previous posts, I do have a love affair with America and happy to try out new recipes and new flavours. 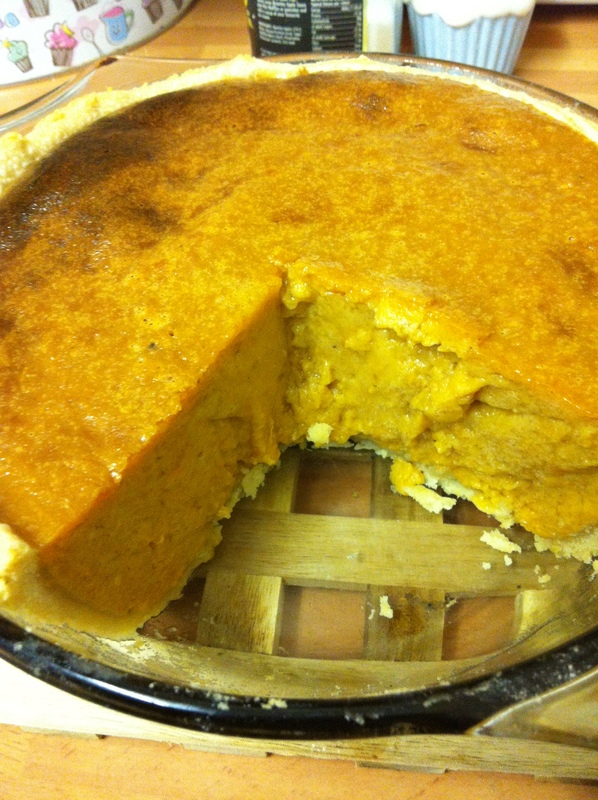 So to carry on my love affair for all things American and recipes from Joy the Baker , I made a Sweet Potato pie for some friends we had around for dinner recently. 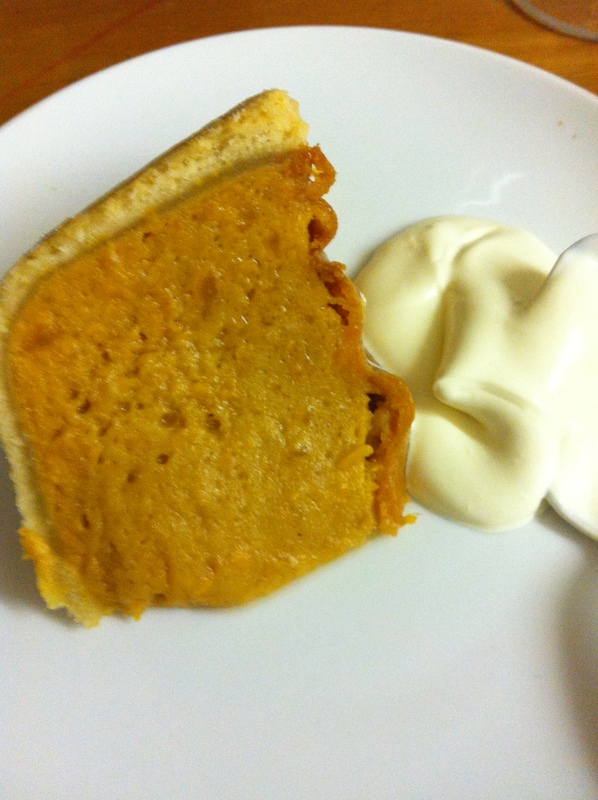 It was quite an Autumnal menu, with a butternut squash and sage risotto for the main course then my pie for dessert. It’s fair to say like any gathering of girls, glasses of wine and gossip was abundant as well as the food. 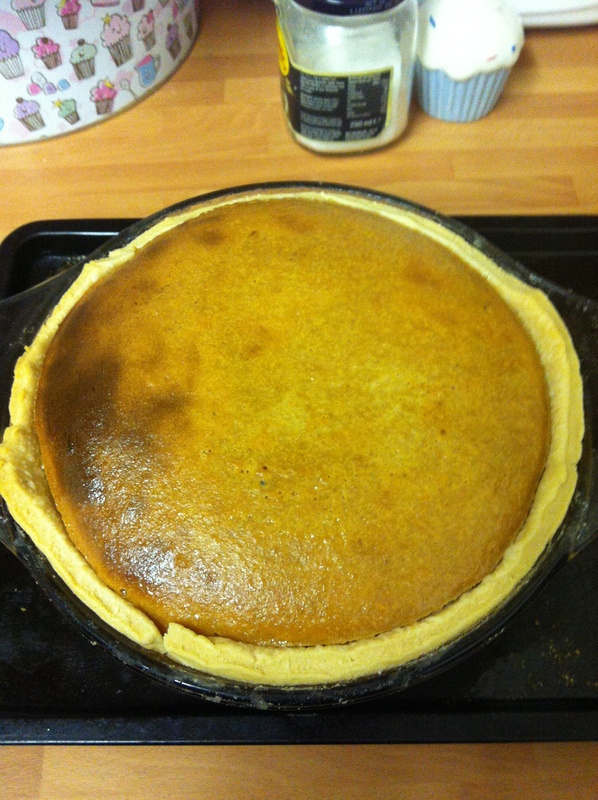 Some of my work colleges thought it was weird to have a sweet sweet potato pie, but the results were glorious and I plan to make it again very soon for some more friends. The peppery notes from the nutmeg worked well with the warmth from the cinnamon and made the pie really comforting. I didn’t have any ground coriander but doubled the cinnamon as I live in a house of cinnamon fans. I peeled and cooked the potatoes the night before as I wasn’t going to have much time once I came home from work and my friends arrived. They were a bit watery the next day, so just strained them before carrying on with the recipe. Now I know that I’m a bad foodie and should be making everything from scratch – I bought some ready-made pastry, bad I know but it was a spur of the moment dinner and didn’t have a chance to make some. I’m typing this with my head hung in shame. I was also a bit dubious about not blind baking the pastry, but due to the long cook the pie had, the pastry remained nice and crisp, even though I made a very deep pie. We had it warm from the oven with thick cream and what was left I took it to work for my lunch and had cold. The flavours had a chance to infuse, Joy mentions in the recipe if you can make the mixture the day before making to allow for this, sadly I just didn’t have time but still great taste! Slice up the bad boy! 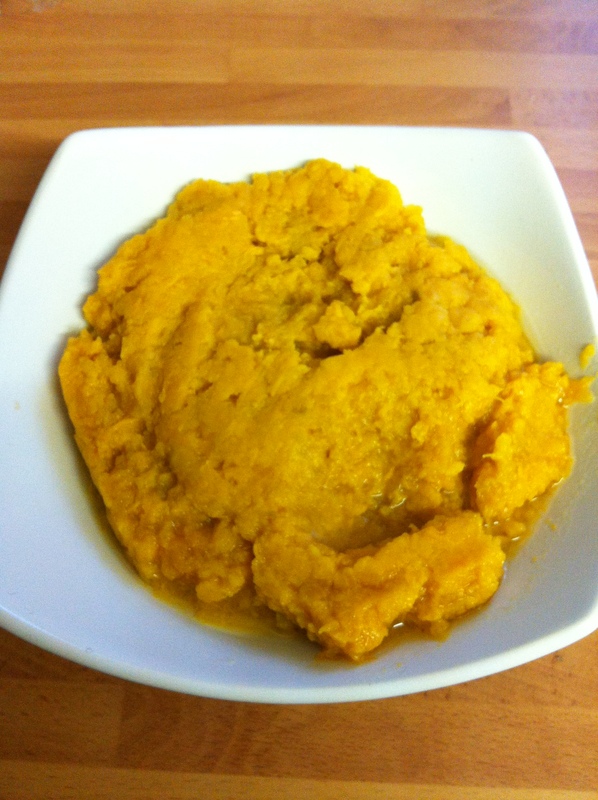 Add the cooked mash sweet potato to a medium saucepan, add the brown sugar, spices, butter, half the evaporated milk. Over a low heat, cook the mixture for about 5 minutes until it starts to bubble. Set aside to cool. In another bowl, whisk the eggs until well mixed, then adding the remaining amount of evaporated milk, caster sugar and vanilla and mixed again until all lovely and creamy. Slowly mix the sweet potato mixture to the egg mixture, making sure thing is nicely mixed together. At this point, you can chill overnight for the flavours to develop more or bake straight away. Place a baking tray in the oven, heat to 200C. Butter a large pie dish, and line with the rolled out pastry and trim to neat but don’t cut too short or the pastry will shrink back. 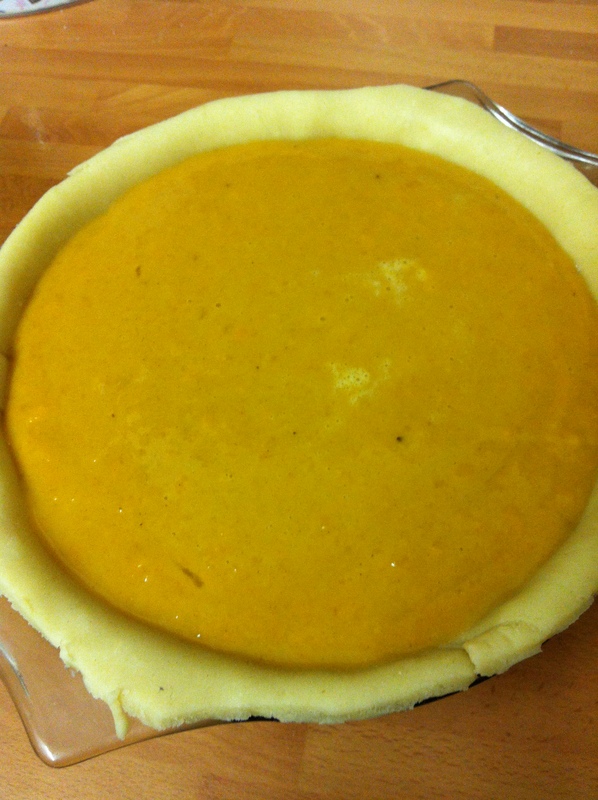 Pour in the cooled down mixture into the pastry case and place the dish on the hot baking tray in the oven. Bake for 10 minutes then turn down the temperature to 160C and cook for 50-60 minutes until the centre no longer has a wiggle. Cool to room temperature and serve with cream and tuck right in!